By the search paths that lead many of you here, you want to know more about how to repair your airplane, or for information on the plumbing, sheetmetal work, woodworking, or fabric work of building your own plane. First, go to the Experimental Aircraft Association (EAA). If you don't already know who EAA is, I cannot recommend them highly enough - this is the repository of over 50 years of homebuilding experience, tens of thousands of aircraft and their designers, builder groups, mechanic and owners who fix 'em, and the pilots who fly them. 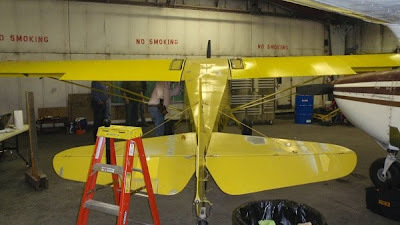 They're not just experimental aircraft people, either - they help support the classic and antique aircraft, not only coming up with better repairs and help with restoration, but also modern technological modifications and improvements. Now for the away-from-computer solutions. First, EAA holds workshops around the country, so you can move from theoretical to practical knowledge, hands-on, with tools and guidance. If none of those are taking place near you, or soon enough, check out your local EAA chapter. There's almost always someone who's building something going on, and usually you can learn more, see more, and try more by talking to these folks. If you have your eye on a specific plane, it probably has an owner's group, and that owner's group probably has an email list, a forum, a newsletter, fly-ins, and nearby members who can show you a thing or five. Most importantly, don't discount your local airport. Years ago, I screwed up my courage and talked to an A&P IA who owns his own shop on the field - and he has become a good friend, and a mentor beyond compare. That man is not just worth his weight in gold, but in gem-grade diamond! He has helped me not only with purchasing a project and restoring it, but with life, with maturing into a better person, with shooting, with coping with my fiance having a heart attack while I was thousands of miles away... Words fail in expressing how much he means to me. Videos and internet opinions can only take you so far - if you find a mentor to work beside, you will be worlds ahead and on your way.